Green sophomore Kame Sweeney scored a team high 14 points in the Bobcats home loss to Ironton St. Joe. FRANKLIN FURNACE – The grind of a season can be difficult at various points, particularly as the season slowly grinds to a halt after the Christmas break. 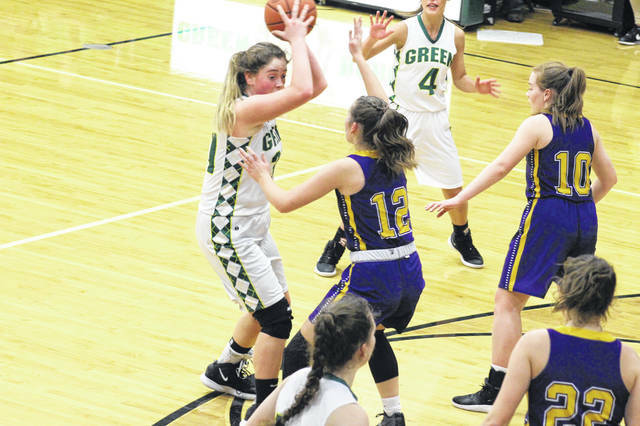 After trailing by just four entering the fourth at 29-25, the Green Bobcats were outscored 14-4 in the fourth to fall to the Ironton St. Joe Flyers on Wednesday night. Wednesday night’s game between the two was close throughout, seeing the Flyers do what it took to pick up a road win over a young Green squad. With Kasey Kimbler still feeling the effects of a sickness that had sidelined her for several days, the Bobcats took their offensive production to the likes of Kame Sweeney who finished with a team high 14 points. Even though Kimbler, the Bobcats talented freshman guard, was not her normal self after dealing with her illness, she was still able to score seven for her team in the loss. One player that made an immediate impact for her team was senior Logan Jones. Upon entering the game from her rotation role, Jones did an excellent job grabbing rebounds to help keep possessions alive for the Bobcats, as well as defending the paint when the Flyers would attempt to attack the rim. Following this loss, Green travels to East on Thursday to try and pick up a road conference win. After that, Knapp says it’s important her kids get back in the gym and continue to work and get better as the season continues to wind down.